This is the latest in the Pathfinder Tales series. Gideon Gull is a bard (OK, all of you role playing geeks can now let out a large moan of anguish). He is also a spy. And, he has a Big Secret from his past, though he cannot remember much about it. When you throw all of these old fantasy tropes together, it sounds as though the story is going to be much like a B movie. I am glad that it wasn't...well, not so much anyway.I usually read the Pathfinder Tales books as mind candy. They are nice to consume but are not that taxing or filling. This one, though, leaned a little on the meaty side. The story was sufficiently complex, with only a few instances of deus ex machina, that it kept my interest. Because of the interesting story--the spies have to track down the cause of a fog that takes over people's minds and plays on their xenophobic fears (a little bit of social commentary hidden in the story, too)--I found myself sucked into the world of Golarion, which, to me, is a good thing. Some of the situations with the fog were reminiscent of World War I and the poison gas attacks on the war front (not that I was there, mind you, but I have read about them...), which was a touch over the top. There were a couple of other more modernish types of devices; I don't want to describe them because I do not want to spoil the story. But, these sorts of situations aside, the story was compelling. And, it even made bards seem effective...at least a little.The characterization, for me, was a bit off. There was quite a bit of movie one-liners throughout that just seemed out of character. In one paragraph, Gideon is scared witless; in the next, he is trotting out a "memorable" line directed at his foes (or friends). I also grew rather tired of the "we don't know what our relationship status is" descriptors of Gideon and his partner Corvine. Yes, I know that relationships are often like this. I get it. I just grew weary of hearing about it every third page or so. It seemed as though the characters did not grow. And maybe that is my problem, not the author's. I probably should not expect that characters with ambiguous relationships will grow to either like or hate each other by the end of the book, rather than the more realistic still have ambiguous relationships.Finally, I did like Mr. Willrich's take on bardic magic. That is, all spells are tied to songs. And he provided several examples of songs throughout the book. I believe I picked up on the melodies of a couple: the patriotic song seemed to be based on Battle Hymn of the Republic, for exampleAll-in-all, a nice read. A step up from the recent fare in this line. Reading this book was a very strange experience. It started with an interesting prologue, but then the first two chapters where the author wants to introduce most of the characters was really not my cup of tea. I actually did put this book down to read some other books in between. But then once I was a bit further into this book it became very interesting, with cool dialogue, nice characters, a very nice way of depicting bards, druids and bardic magic and a nice story. I also have the impression that Chris Willrich is a real roleplayer. Some scenes and comments in this book betray that he knows the feeling of sitting around a table, seeing your hero struggle to get through the dungeon to reach his goal. Most D&D novels (and that includes Pathfinder) have this problem where they don't want to be D&D novels. So usually they go for a generic "save the world (or portion of it) from an evil menace" thing and ignoring many basic precepts of the D&D (or Pathfinder) rules. This seemingly starts off that way, but really turns into a Scooby Doo adventure more than anything else. A meandering oneExcept there's no talking dog and the closest thing to an interesting (or at least amusing) character exits about 1/3 of the way in, leaving just the protagonist who is even duller than Fred from Scooby Doo. I can't remember a novel where I liked the protagonist less. I didn't hate him, just felt nothing towards him.It also seems like they tried to crib the "bards are spies" thing from D&D's Forgotten Realms, where you have the Harpers who are agents. It's a bit different here, since just work for a spy agency in a country. Exploring some of the main sections of the world of Golarion this is a surprisingly character focused story for a role playing game novel. It is great fun and takes on a core idea that could have been done as a joke (a party of all Bards - well bards plus spies). The world building and character creation is great and the overall plot and pacing fun. However as a long time GM and player there are elements that aren’t quite right about the way magic is depicted that did grate slightly (but forgivably so) and it is rare to see bards depicted in fiction so this is fun. Overall a fun and quick read. Overall, I was torn about how much I liked Dagger of Trust. On one hand, it was a nice change of pace from a more typical high fantasy adventure with swordsmen and wizards fighting evil and monsters, etc. The focus on bards as the main characters and a spy themed story was very welcome. Also, as game based fiction in the Pathfinder universe, setting the book in the Taldor and Andoran was a nice change of pace, as these regions are fairly major in the world, but haven't been used in the Pathfinder fiction line before, and are little used in the line of RPG adventures as well.That being said, while Willrich did a good job keeping tension in the story, and providing an interesting threat for the protagonists to tangle with, there were some things that didn't work as well for me. Gideon Gull, the main character is only a student in the Lion Blades, Taldor's spy agency, but spends way too much time dealing with his past, and his love interest. Sure, every spy needs to have a love interest, it's part of the tropes of the spy genre, but Gideon approaches it like a lovesick schoolboy. Almost all of the secondary characters also have romantic drama in a similar vein. While romance can be a good B-plot in an action story, in this case it really didn't fit. When you add in the one secondary character who doesn't have a romance in the book as a puppeteer used mostly for comic relief, it really takes the story into Roger Moore James Bond territory, rather than the hard bitten Sean Connery or Daniel Craig portrayals of Bond, which really are a far better model for spy fiction. On top of that, while the plot of a magical fog that turns ordinary citizens into rage filled mobs that seem directed by some hidden foe is compelling, the ultimate conclusion of the plot is pretty simplistic and relies on too much suspension of disbelief. Without giving too much away, the entire Lion Blade agency is played by a harp (pun intended - they're all bards, see!) by an enemy who really doesn't seem to have the ability or experience to do so. The climax of the story also comes off far too steampunk/magic-punk to fit well with the established world of Golarion, especially in the regions that the action takes place in. The fact that the enemies can only be stopped by a trio of cadets who aren't done with their training also is a poor plot point. If nations are threatened and need saving, the heroes who do so need to be capable enough to sell that they're up for the task, not new heroes at the beginning of their careers. Finally, while the use of the Lion Blades was a cool choice, they don't really fit the plot that was used in the book. As bards and spies, they're really at their best when dealing with intrigue in social settings, not when dealing with threats in remote borderlands that are far better protected by frontiersmen, rangers, and more traditional rough and tumble adventurers. Lion Blades really shine in plots more like Ocean's Eleven for example. One of the best Path finder novels I have read thus far, the work is overall very clever with a lot of awesome word play and artsy quality that is perfect in a novel all about Bards. And what Bards too! For all those that dream of the power of the pathfinder Bard, this book is for you. But seriously, it was very well done. It was designed to be a bardic tale of good quality. The chapter titles fit well with the motif, and within one finds a lively work of auxilery material in the forms of various songs, poems, and stories that the bards perform. Some are so catchy that I still find myself humming them even though I've technically never really heard them in the real world (i.e. Taldor rats are big as cats, the song about how Taldor has the worlds best rats). The ending was a bit bitter sweat and I think I could detect George R. Martin rubbing his hands in the back ground somewhere and repeating "good...good..." over and over...yet overall theres a lot of interesting perspective to be found in this book and a lot of enjoyment for those who find paths. And, with a few exceptions perhaps, this novel is miles ahead of most of its peer pathfinder novels in the form of strong characters that one is apt to care about and a catchy plot that kept me guessing what was coming next. Here's hoping for a sequel? So long as Willrich doesn't succumb to his inner martin and kill the remaining characters. Just all around not good. I was rooting for this book, because it covered a lot of crucial lore territory in the Pathfinder world - Taldor, Andoran, and the druids of the forests in between. Add in the very secretive Lion's blade organization and I read every page, hoping it would get better. The plot is a Scooby Doo episodeThe Lions blades comes off very cartoony as well. The character interactions are DeGrassi High or some other teenage tv show. It is not good. I hate writing bad reviews - and its rare if you check mine - so let's focus on the positive for a moment.- you have a character who is into puppetry as a serious artform, which is just awesome. - a relatively strong case is made for non-democratic governments - the Taldor loyalists are believable in their discourse, not played off as simple crazies or power freaks.- the poetry and song, especially the Andoran patriotic ones, are just fantastic. I wish i had a book with all of them collected in one place! Fantastic stuff. If you are a Pathfinder junkie, fight your way through it and you will be grateful for the content you can glean from it. If you are just looking for a decent yarn, move on to something else. I liked this Pathfinder novel. At times, it seemed a little slow and too much exposition than moving the plot at times. (view spoiler)[The overall story was good, with characters attempting large-scale political politics with concurrent inter-personal politics and scheming. While Gideon talked about being torn between Andoran and Taldor, I just didn't feel his conflict. But I liked the reveal of the puppet-master, and enjoyed guessing at which female Gideon could not trust. (hide spoiler)]I did enjoy that it gave narrative insight into the mechanics of a character class, this one of course being bards (like alchemists in City of the Fallen Sky and paladins in King of Chaos). But really just too much bards for my taste. This book felt like the author was trying a little too hard to make Pathfinder bards better than they are. This one had all the things I like in a fantasy book - drama, romance, intrigue, betrayal, dungeon crawls, & song & dance too. Chris Willrich - Chris Willrich writes fantasy and science fiction, and is best known for his sword-and-sorcery short fiction about Persimmon Gaunt and Imago Bone -- a pair of lovers, partners in crime, and, far more often than they'd like to admit, heroes. 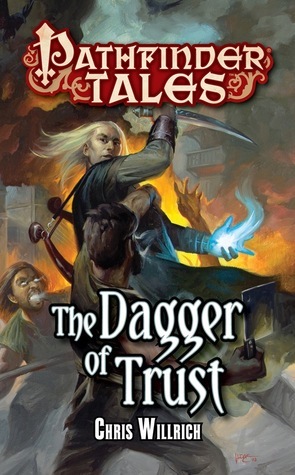 The first novel featuring Gaunt and Bone, THE SCROLL OF YEARS, appeared in September 2013 from Pyr, followed by THE SILK MAP in May 2014.Willrich is also the author of THE DAGGER OF TRUST, a book set in the world of the Pathfinder Roleplaying Game from Paizo Publishing. DAGGER is a tale featuring bards, secret agents, sorcerous evil, monsters, and betrayal.Willrich is a former librarian for the Santa Clara County Library District who lives in Mountain View, California with his family. He is frequently attacked by youngsters with lightsabers.